This rugged hatchback from Toyota comes with a ground clearance of 170 mm. Toyota has introduced this hatchback in India for off road driving. Considering its high ground clearance, it fits perfectly in its intended role of cross country driving. High ground clearance always has to be balanced against handling performance of the car. If the ground clearance is too high, then the center of gravity also increases, thereby creating problems with the vehicle at high speed. Moreover, high ground clearance also protects the undercarriage from stones and other things strewn on the roads. The main competitors of this car in the Indian market are Maruti Suzuki Swift, Honda Brio, Ford Figo, Volkswagen Polo, Hyundai Grand i10, TATA Bolt and Toyota Etios Liva. Among these cars only TATA Etios Liva and Maruti Suzuki Swift has similar 170 mm of ground clearance. The other competitors have lower ground clearance such as Honda Brio has 165 mm, Ford Figo and Volkswagen Polo have 168 mm of clearance, and Hyundai Grand i10 and TATA Bolt have 165 mm of clearance. 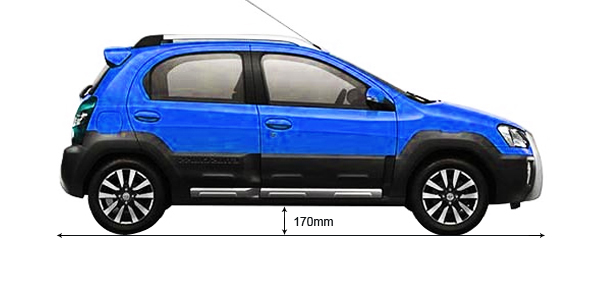 Compare ground clearance of Toyota Etios Cross with its immediate competitors. Ground clearance of Toyota Etios Cross competes directly with Maruti Suzuki Swift, Honda Brio, Ford Figo, and Volkswagen Polo. Put straight, any ground clearance crossing 170mm is considered to be decent, whereas, in case the ground clearance of a car is below 160mm, it's not good for Indian roads. Another thing that should be considered while making a buying decision is that cars with ground clearance of less than 160mm would be fine if the intended driving terrain doesn't have any bumps. Think of what sort of roads do you have in your locality and at your expected visits, then zero down your purchase.